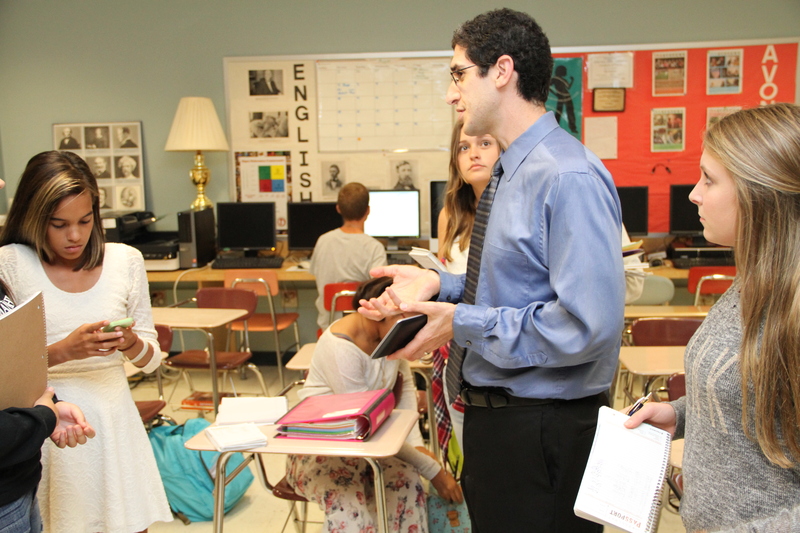 Scott Tuffiash, this week’s Educator of the Week, connects his journalism students with peers in Lebanon through PenPal Schools. His students build meaningful connections while learning about global issues in the news. Scott will be presenting alongside staff from PenPal Schools and iEARN during our October 1st Google+ Hangout on Global Collaborative Projects. Tune in! For the past four years, I’ve been involved with a global project through PenPal Schools, specifically through their PenPal News program. This project brings an international component into my class, and allows my students to develop meaningful relationships with their pen pals. Our current partner school is in Tyre, Lebanon. Once a week, my journalism students watch a video, read an article, or listen to a podcast about an event or topic in the news. Topics, chosen by PenPal Schools, cover a wide variety of current news events, including political elections, economic struggles, border security, and other hard-news topics. After analyzing the media, my students start off by responding to some questions provided by PenPal Schools. They then craft their own questions and engage in personal correspondence with students in Tyre. Here’s a snapshot of a PenPal News topic on poverty, which accompanied a featured article from NPR. How does this activity impact your students? The PenPal News program challenges them to craft precise questions for their international partners to read and consider. If my students can develop a keen sense of how to elicit meaningful answers from a peer writing in his or her second language, they can certainly practice high-quality reporting right here when they work as student journalists around the school. Some of my students have kept in touch with their pen pal through social media, and a few have developed friendships that have lasted for years. Scott’s current Journalism 1 students check online for background information and listen to a final reporting suggestion before leaving to complete interviews, a skill bolstered by global dialogue through PenPal Schools. Photograph by current Journalism 1 student Ethan Woodfill. How does teaching with a global mindset impact your students? What is one simple activity to get students to think about their world? Ask your students to briefly write down two major challenges they face daily. Push for specifics! Let them write and talk about how much better their lives would be, and what else they could experience and accomplish, if they could just solve these problems. Next, use Google Maps, Google Earth, or Nat Geo’s MapMaker Interactive to show any town in any country—and ask if students in this town might have these problems as well. Scott’s Journalism 1 class requires daily technology usage, from global collaboration to design and layout work as pictured here. Photograph by current Journalism 1 student Ethan Woodfill. Do you have advice for teachers who want to get more involved with global programs? Start with a program that provides resources and support, like PenPal Schools. Determine what standards you want and need to address through the program. Schedule time in your class to proctor and participate—and soon you will be experiencing a dynamic shift in how your students learn. What are you looking forward to this school year? This is my fourth year of working through the Write On Forum with iEARN, which is another global collaborative project that allows me to run a year-long literary research project for my Honors English classes. It’s exciting to know we’ll be learning about literature, storytelling, and national identity with partners from different global literary traditions. I’ll also have my first experience working with the Places and Perspectives iEARN Learning Circle. I recently signed up for the Out of Eden Learn project. I’m very hopeful my students can develop a good angle for a feature story assignment and get the chance to interview kids their age from different locales. The daily opportunity as a public school teacher to create a more thoughtful, deliberate, empathetic, and peaceful world one person at a time. Scott Tuffiash has been teaching high school Language Arts for the past 12 years. He has been involved with global collaborative projects through TakingItGlobal, iEARN, and PenPal Schools for the past six years in various classes, while also advising the avonews staff and teaching journalism at Avonworth High School in Pittsburgh, Pennsylvania. Want to get involved with PenPal Schools? Sign up for their next 6-week session by October 15th. The Educator of the Week series features inspiring activities and lessons that educators are implementing with their students that connect them to the world in bold and exciting ways. Previous Previous post: What’s Going On in Hong Kong?